Sharks coach Robert du Preez has, surprisingly, praised his players following their 21-14 loss to the Reds in Durban on Friday. The Reds added to the Sharks' woes when they won their Super Rugby encounter at Kings Park. Sharks coach Robert du Preez acknowledges that he must be held accountable when the side dishes up poor performances. Reds coach Brad Thorn expects a tough encounter against the Sharks at Kings Park. The Reds have named their side for Friday's Super Rugby clash against the Sharks in Durban. Springbok props Coenie Oosthuizen and Tendai Mtawarira return to the Sharks' starting line-up to play the Reds on Friday afternoon. SA conference shock: Why JAGUARES will win it! 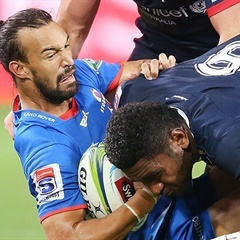 Herman Mostert highlights FIVE talking points after Week 9 of the 2019 Super Rugby competition. The Sharks dished up one of the worst performances you could ever hope to see as they were thrashed by the Jaguares in Durban on Saturday. Sharks wing Makazole Mapimpi says he is not paying attention to the Springbok hype surrounding his 2019 form.